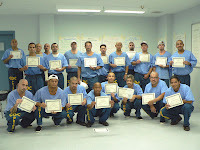 In 2010, CDCR launched a new way of delivering rehabilitative programs that focus on reaching inmates and parolees with less resources and targeting those individuals at the highest risk to recidivate. The department will do so by targeting its resources on evidence-based practices including prioritizing placing offenders into programs based on their risk to reoffend, criminogenic need, and time left to serve, Siggins added. This effort follows a major reorganization which resulted in a 70 percent reduction in spending on program-related functions. The Office of Community Partnerships, which works with community-based organizations and volunteers to provide services to help offenders turn their lives around. In addition, the rehabilitation reform-related functions (assessments, training, fidelity, and performance measurements) have been consolidated into one Office of Rehabilitative Program Planning & Accountability. The department will emphasize General Education Development (GED) attainment and vocational programs linked to strong job market demand and that can be completed in 12 months. CDCR will use non-traditional methods of delivering educational services that rely on best practices in adult education and will provide training to long-term offenders as substance abuse counselors and literacy tutors. Changes in vocational programs will be implemented by February 2010 and in academic services by May 2010. CDCR will also be providing shorter substance abuse treatment to serve 8,500 inmates annually — compared to approximately 12,200 previously. The department’s new model, developed in consultation with the UC San Diego, Center for Criminality & Addiction Research, Training & Application began in January. Inmates will receive services near the end of their confinement and will be encouraged to complete community treatment upon release — a combination that significantly reduces recidivism, studies suggest. “All of these new models are designed to maximize the number of offenders we can serve in effective programming,” Siggins said. “Our department is working hard to focus limited resources on programs most likely to help inmates stay out of prison and keep our prisons and our community’s safe,” she said.